This Paper Plate Maraca is an easy homemade instrument. Fill it with what ever you have around the house and you're ready to make some music! These also make great noise makers for special occasions! 1. 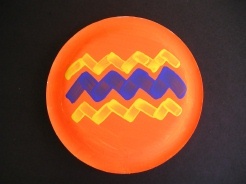 Paint your paper plates any color and design you choose - eating side down. 2. Once the paint is dry fill one paper plate with dried beans, popcorn, rocks or anything you have around the house that will make noise. Glue the paper plates together, and you're done!